Letter from the Department of the Secretary of State, Office of the Custodian, to Libero Sauro, October 18, 1943. In this letter, the CEP is contacting Sauro regarding the collection of the $15 administration fee owing to the department. Comparable to ca. $250 today, Sauro was interned for less than four months. This is a third follow-up letter to another in the collection (see ICEA2010-0008-0009, ICEA2010-0008-0008 and ICEA2010-0008-0007). Recto: [t-b, l-r]: [printed on paper] CANADA / DEPARTMENT OF THE SECRETARY OF STATE / OFFICE OF THE CUSTODIAN / ADDRESS ALL / COMMUNICATIONS / TO THE / CUSTODIAN’S OFFICE / PLEASE REFER TO / FILE NO. 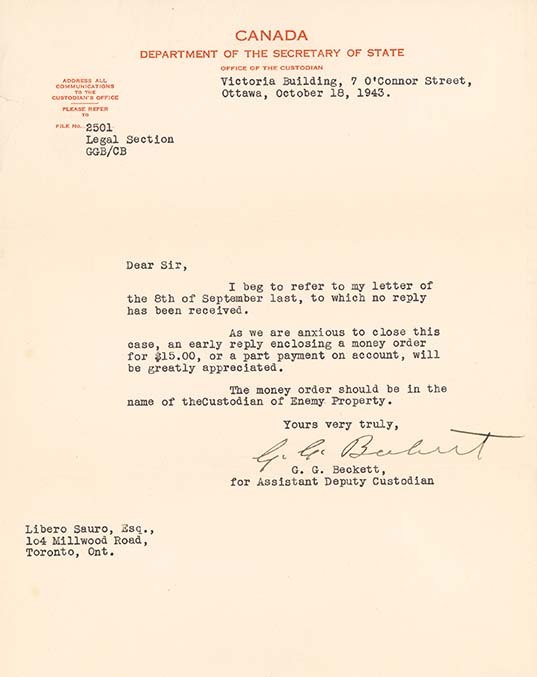 [dotted line] [typed] Victoria Building, 7 O’Connor Street, / Ottawa, October 18, 1943. / 2501 / Legal Section / GGB//CB / Dear Sir: / I beg to refer to my letter of / the 8th of September last, to which no reply / has been received. / As we are anxious to close this / case, an early reply enclosing a money order / for $15.00, or a part payment on account, will / be greatly appreciated. / The money order should be in the / name of theCustodian [sic] of Enemy Property. / Yours very truly, [signature in ink] [typed] G.G. Beckett, / for Assistant Deputy Custodian / Libero Sauro, Esq., / 104 Millwood Road, / Toronto, Ont.